I’ve always been fascinated by the medieval era and have written three standalone medieval romances. I decided I wanted to go bigger, so I created The Knights of Valor. 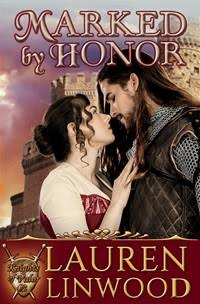 Word of Honor was the first book in this series, and now Marked by Honor is the second. I introduced Raynor Le Roux in Book 1 and left him with a broken heart. Now in Book 2, he gets his HEA with Beatrice Bordel. Besides romance, I am wild for thrillers. Steve Berry and Brad Meltzer are two authors I enjoy reading because they weave in historical details that become an integral part of the plot. I adore Pride and Prejudice’s Elizabeth Bennet. She is feisty, intelligent, and has a good heart. I’m deep into my Knights of Valor series. Code of Honor is Book 3, and it will come out October 5. I’ve just finished writing Journey to Honor, Book 4 in the series. It will release early in 2017. Two more books will finish out the series next year. I just need to get them written! Lady Beatrice Bordel blames herself for the riding accident that cost her father his life when she was a child. Tragedy strikes again when her mother and grandfather die on the same day, leaving her homeless. The young woman decides to travel to visit her grandfather’s closest friend, hoping she can use her domestic skills and lute-playing talent to find a permanent place in his household. Barely into her journey, a band of highwaymen accosts Beatrice and her sole servant. All seems lost—until Raynor Le Roux arrives. As a knight of the realm, the code of chivalry guides Raynor’s life. While returning to his family’s home after many months absence, he rescues Beatrice, who tells a white lie to this handsome stranger. Raynor takes her to safety at Ashcroft, but his home has changed during his time away. No longer a thriving estate, Ashcroft has fallen into disrepair because his brother Peter is no longer interested in its welfare after his wife’s untimely death. Raynor determines to restore his home before he escorts Beatrice north so she may unite with the man he believes is her betrothed. The couple’s growing attraction turns to love, but Beatrice’s dishonesty stands between her and Raynor’s happiness. Will she finally tell him the truth—and hope he forgives her deception—or will it be too late? This is one of my favorite covers, Kayelle! It really captures Raynor & Beatrice well. Thanks for letting me stop by and share with your readers. I love visiting at RLF!